History is about to repeat itself. Malani Fonseka and Vijaya Kumaratunga dazzled the wide screen with Yasapalitha Nanayakkara’s yesteryear movie Thushara in 1973. Now a new couple, Saliya Sathyajith and Shalika Edirisinghe, is set to recapture the magic of the old hit with Sahan Wijesinghe’s new version of the movie. The Daily News met Wijesinghe to inquire about his attempt to revive the memories of the past to the present audience. * Why did you decide to start your directorial debut with a remake? Though we are advanced in technology I have always felt that the present movies lack the beauty of past hits. Movies made in the 1960s and 70s made use of the cream of the industry, from the stars in the lead roles to the music and plot. I have watched Nanayakkara’s Thushara 26 times and I had the hope of doing a remake. However I did not plan on directing the movie. My aim had been to produce and act in the remake. It is after more than three decades that the film is coming back to the audience. I believe that I have made the best choices in doing justice to the original version. Some people including NFC chairman, Jayantha Darmadasa, said that I have made a good job of it. It is up to the audience to decide whether my attempt if fruitful. * Besides directing and producing the film, you portray a role as well. Yes, I have taken on the role of the villain originally acted by Baptist Fernando. If the remake was done 10 or 15 years ago I would have taken on the lead role. * Why did you decide on Saliya and Shalika for the lead? I searched for actors to suit the characters for over a year and finally came upon Saliya. Saliya possessed the charisma I was searching for and I believe Shanika is quite suited to the role. It is sad to say that most of the actors of today do not possess the power to attract the masses. I wish to invite the audience to see the film and decide for themselves whether they find the couple and the film captivating. Around 50 per cent of the success of a film lies in its cast. The new faces in the movie cannot be compared with the old ones. However I have learnt to recognise a successful creation through experience. One of the reasons for the failure of films is they feature actors who are seen often in television. Countries like India have a separate group of actors for television and a separate group for cinema. Filmmakers need to understand that people do not wish to see the faces that they see often on television on the wide screen. * Thushara the original version portrays society in the 1970s. Did you make changes in the script to suit the contemporary society? I altered the ending of the film. In the old hit the police take the villain away but in my version the villain turns up at the wedding. I did not plan on making this change but it just struck me on the morning that the last scene was set for shooting that such a change is appropriate. I have also set the film in the modern backdrop. Though the film goes along with the old version there is a difference. It would not work to use the same types of frames as the original for the new version. That is one of the reasons why Hathara Dennama Soorayo went wrong. I love this industry a lot and have watched around 900 films from out of about 1300 films that have joined our 61-year-old Sinhala cinema history. If someone is planning to do a remake it is fine as long as justice is done to the original film. * Some complain that there is lack of good scripts today. What if filmmakers see remakes as the answer to this problem? There is a global interest towards making remakes. Some were failures but some were successful, India remade ‘Don’ and it was an instant hit. Similarly the remake of the Tamil movie Billa was also a success. The remakes of Sujatha and Hathara Dennama Soorayo drew in crowds because those who had enjoyed the old film wished to see the new version. * Are you using the original songs for the movie? The eight songs in the film are the originals sung by Jothipala but I have dubbed music into the old tracks. This is because the quality of the original music was not good. Some advised me to use a ‘superstar’ vocalist to sing the songs but after considering all the facts I concluded in the end that Jothipala is still the superstar of the Sri Lankan music scene. No one had been able to reach his standard. * When do you hope to screen the film? We started shooting in December 2007. There are a few scenes yet to be shot for a song. I hope to release the film at the end of October or early September. * Are you planning on doing another film after Thushara? I wish to do a few more remakes before beginning on a film with a new screenplay. There is much that I have to take from the old films and I hope to go for a new creation by learning from these old films. Pumi Purasinghe, Sahan Wijesinghe, Buddhika Rambukwella, Robin Fernando, Rex Koddipilli, Chathura Perera, Chitra Wakishta, Anju Bandara, Chathura Perera, Nimali Kapuge, Lasantha de Alwis, Remenzi Fernando, Chanchala Warnasuriya, Kumara Ranepura, Sarath de Silva, Rizwan Fa and others are included in the cast. Sonia Dissanayake who played a significant role in the original movie had taken on the role of Saliya’s mother. The music is by Sarath de Alwis, make up by J. Suranimala and choreography by Lalith Pushpakumara. 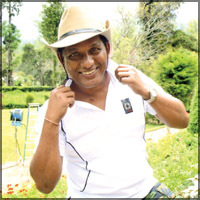 K. D. Dayananda is the cameraman while Lasantha de Alwis is the assistant director and art director. Gayana Sudarshani is the executive producer and Lalith Gunatileke is the production manager.